Should You Go Wired Or Wireless For Your Home Security System? | Calgary Alarm Inc.
With the level of crime in Calgary being at an all-time high, it is imperative that all houses have a security system. Home security systems are so powerful that they can deter burglars by as much as 50 per cent. When it comes to home security systems, there are two types: wired and wireless. The difference between the two systems is in how the security devices (such as the sensors) communicate with the control panel, which is the hub of the system and is responsible for sounding the alarm. The wired alarm communicates via its wires that are hidden in the walls of a home while the wireless alarm system communicates via radio signals. Both systems can be monitored and send signals different ways, including via the Internet, the landline or at the cellular level depending on the alarm that you purchase. Both also have a lot of support. With that in mind, which one should you choose? In terms of the wired alarm system, it is generally considered to be the most reliable alarm system due to the fact that batteries aren’t needed to power its sensors and radio signals aren’t in the picture. They are also low maintenance (wireless alarms require that you change the batteries). Another added benefit is that wired alarm systems have backward compatibility in their favour, meaning you won’t need to replace the entire system in order to do an upgrade. 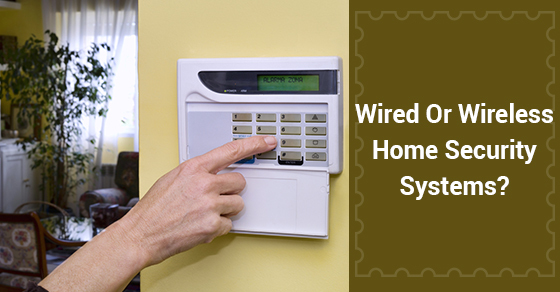 Since wired alarms can cover more space, this system would be more beneficial for those with larger homes. In terms of a wireless system, installation is easier since you will not need to cut into the walls. In fact, it generally only takes a few hours to complete. With this alarm, you can go the DIY route since only a little drilling is required, but professional installation is always preferred, regardless of the type of security system. Wireless systems also make adding additional sensors in the future much easier since all that is required is simply connecting them to the control panel – no wires involved. If you have plans to move in the future, you can also easily take your wireless security with you, meaning that wireless security systems also have portability going for them. As one of the best security alarm monitoring companies in Canada, consider Calgary Alarm for your choice of home and commercial security. Contact us today for more info.